Click on page number to go directly to an enlargement of that page. The above maps are also available on CD for a fee of $10.00 each. 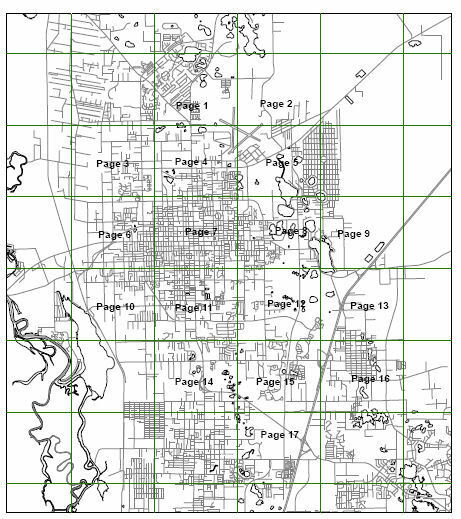 City of DeLand Map Disclaimer: All maps provided are graphic representations and are not intended to be used for any engineering or surveying purposes. These maps are for informational purposes only; and the City of DeLand is not liable for any decisions made on the basis of these maps or on the information contained within the maps. All data used is the property of its respective owner(s). As data may sometimes change, please contact the City of DeLand Planning Division at 386-626-7010 to verify the current zoning or land use designation of a property. Map of all future land use designations within the city limits of DeLand. General map showing the corporate limits of DeLand and all area roads. Recreational Trails for the City of DeLand. Visual representation of the City of DeLand Gateway Overlay Districts, as per Section 33-36 of the Land Development Regulations. Map showing all zoning districts within the city limits of DeLand.